If you have feet, then you have shoes. 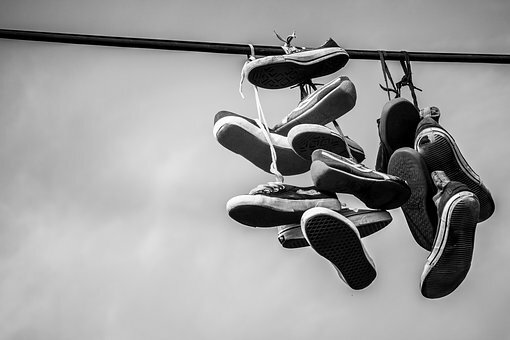 If you have shoes, then you have shoelaces. They may not seem like a nuisance. However, when it’s time to retire your shoelaces, you probably don’t know what to do with them. Usually, they end up in the trash can. Or, if they don’t end up in the trash can, then they are put into the junk drawer. Perhaps, you shove them in your closet and don’t look back. Regardless, there are many unique and easy things that you can do with your old shoelaces. You can reuse shoelaces in decorative crafts. Also, you can use shoelaces to create items that you can use, daily. Essentially, the possibilities are endless. So, let’s take a look at some of the fun ways that you can reuse old shoelaces. There isn’t anything worse than a disorganized jewelry box. Especially, when you can’t find matching earrings. There are ring organizers, necklace organizers. Now, there’s a way for you to organize your earrings. You will need to have a shelf of some sort to tie the shoelaces to. However, it should be easy to find a shelf within your home. First, grab an old shoelace. Next, tie it around the arms of a shelf until it’s nice and tight. Then, the shoelaces should be stable enough to hold your dangling earrings. All of your gorgeous earrings will be perfectly organized and displayed for easy access. Modern plumbing is amazing. It’s clean and convenient. It’s easy to turn on a bathroom sink and clean my face and teeth. However, nothing is worse than a leaking faucet. The one caveat of indoor plumbing is the sound of water dripping on to a drain. But, there’s an unlikely hero in this tale. You can use a shoelace to guide the water to the drain. First, tie the shoelace around the faucet. Make sure that it’s on top of the spout. Next, enjoy a peaceful evening that’s “drip” free. It’s important that you fix the leak because even a small, dripping faucet can waste a lot of water. If you’re planning to go to a water park or just need help holding your glasses in place, then a shoelace can help. First, tie one end of the shoelace to one of the temples of the glasses. Next, tie the other end of the shoelace to the other temple. Then, put the product over your head like a necklace. Once you put your glasses on your face, the shoelaces should stop them from falling. Also, you’re less likely to lose your glasses with your shoelaces to stop them from leaving your body. In conclusion, old shoelaces can be reused to make remarkable things. All things from organizational to practical tools. It’s easy to reuse them. There are even more crafts that you can make with shoelaces. Overall, you don’t need to throw out your old shoelaces. You can get crafty and make great use out of them!